The Vesuvius is an active volcano, currently sleeping, 1280m high, which borders the Bay of Naples to the east of the city. Its last eruption was in 1944. It is explosive, potentially very dangerous, because usually a plug prevents lava from escaping, and when the pressure becomes too strong, everything explodes. 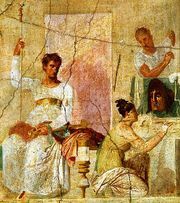 It is among others, responsible for the burial of the Roman cities of Herculaneum and Pompeii during its eruption of August 24 in the year 79 AD, under a rain of ashes (as in Pompeii) and sludge (in Herculaneum) which has kept them until today. In 1999, the national emergency plan provided that in the event of an eruption, the evacuation of approximately 580,000 people in the “red zone” would be required. The mountain is classified national park since 1995.